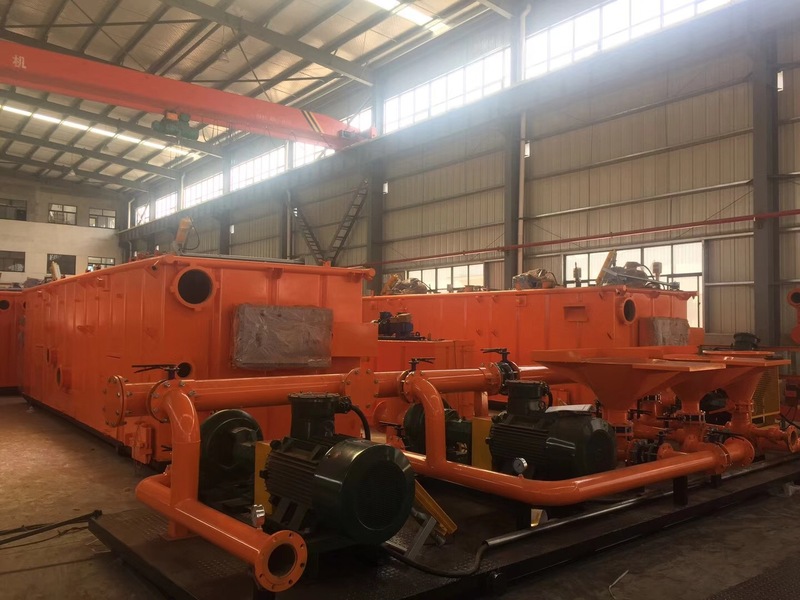 ZJ70 solids control system is designed for 7000 meters oilfield drilling rig, the whole system is customized with standard equipment by different model selection and tank size selection. AIPU built 3 sets ZJ70 system for a China rig company and they package drill rig, solids control system and mud pump to end user in overseas. The whole package include a drill rig, 3 mud pumps, 7 mud tanks with all solids control equipment. 1. 1 set mud distributor with 3 outlets into shale shaker, The distributer sit on shaker tank walk way beside shaker, there is a 10” size inlet with flange. 2. 7 sets mud tank, 1 set trip tank, 1 set shaker tank, 1 set mixing tank with 2 mixing pumps, 1 set shear mixing tank with 3 tank compartment, 1 set suction tank and 3 active tank for clean mud storage. The tank equipped with mud agitators, mud guns, pumps, pipeline arrangement, walk way, stairs and handrails. 3. 3 sets 4 panels shakers, 1 set mud cleaner, 1 set middle speed centrifuge, 1 set high speed centrifuge for drilling cuttings separation. The 2 sets of centrifuges separate solids at different separation points. 4. Poor boy degasser and vacuum degasser installed for gas separate from drilling mud. 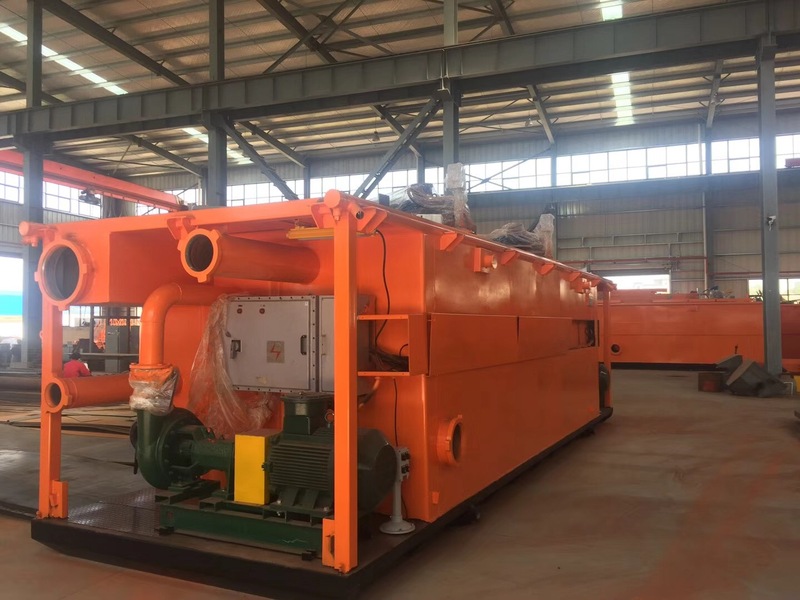 The poor boy degasser stands beside shaker tank, the vacuum degasser sit after shaker before mud cleaner on shaker tank. 1. 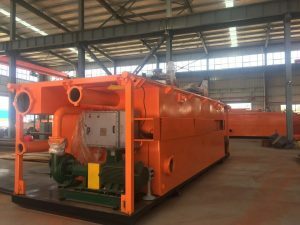 Contact AIPU Solids Control with all details requirements like rig size, mud pump specification, mud flow, tank storage capacity, budget, jobsite space limit, etc. 2. AIPU supply technical drawing as per request, client comment and AIPU update drawing until all details meet requirement. 3. AIPU quotes as per technical requirement, client confirms price as per budget. 4. Client send an Purchase order and Seller make a invoice for payment, or both parties make a sales contract with all technical specification and commercial issues. 5. Seller build as per technical design, we accept client test from client anytime. 6. Whole system pack and delivery as per request. 7. All equipment supply quality assurance 12 months. AIPU will support client after delivery on technical and trouble shouting.